Iowa State came out firing in the first as it jumped to an early 10-3 lead. The Cyclones never let up and cruised to a 25-15 first set win. The second set went and back and forth, but it was Kansas State that held an 11-8 lead nearing the midway point of the set. The Cyclones then used a 4-0 spurt to go in front 12-11. The Wildcats battled back by using a 3-0 run to take a 21-18 lead and then closed out the set on a 3-0 run to even the match at a set apiece. The third set was highly contested throughout. Trailing 22-19, Kansas State reeled off five straight to take a 24-22 lead and earn a set point. But the Cyclones rallied to take four straight points, including a kill by outside hitter Jess Schaben to capture the set, 26-24. 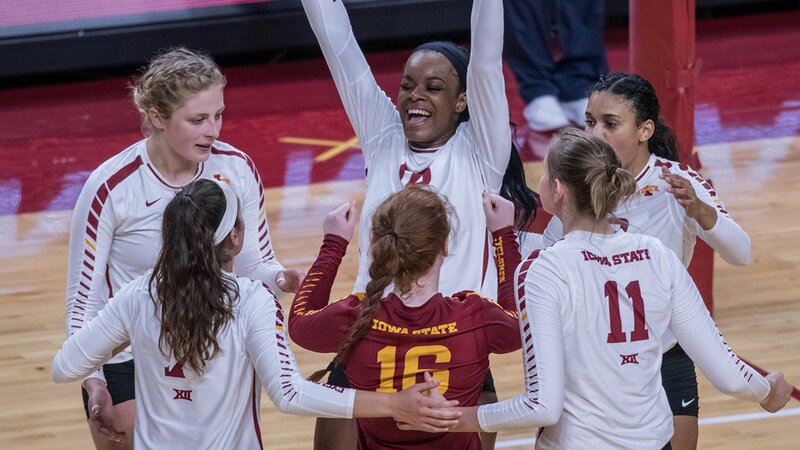 The fourth set went back and forth early, but with an 11-10 lead, Iowa State used a 9-3 spurt to take control for good. With a 20-13 lead, the Cyclones finished off the Wildcats with a 5-2 run, claiming the fourth set, 25-15. The Cyclones were led by middle blocker Grace Lazard, who finished with a match-high 17 kills (.500), 4 digs, and 7 blocks. Iowa State also got 16 kills and 13 digs from outside hitter Jess Schaben, and 13 kills from outside hitter Josie Herbst. The Cyclones put together a balanced defensive effort, as defensive specialist Izzy Enna (19), libero Hali Hillegas (13), and defensive specialist Taylor Baranski (10) all chipped in double-digit digs. For Kansas State, it was outside hitter Kylee Zumach who led the charge, as she tallied 14 kills and 17 digs. The Wildcats also got 11 kills apiece from middle blocker Elle Sandbothe and outside hitter Alyssa Schultejans. Defensive specialist Devan Fairfield led the Wildcats with 19 digs. Iowa State hit .307 as a team and held Kansas State to .173. The Cyclones have struggled at home this season. Iowa State entered the match 4-6 at Hilton Coliseum before it defeated the Wildcats. Iowa State heads to Fort Worth to take on TCU at 12 p.m. ET on Nov. 3. Kansas State hosts West Virginia at 8 p.m. ET on Nov. 3.